Welcome to our hotel with restaurants Lucullus, Pascal Mat & Vin, Entré and Ludvig Vin & Champagne bar. With its central location, our hotel offers one of Bergen’s largest collections of modern art, and a wide choice of entertainment and show packages. At our hotel you'll find several popular restaurants: Lucullus banquet facilities, Pascal Mat & Vin, Entré and Ludvig Vin & Champagne bar. We also have one of the biggest art collections in Bergen. If you enjoy shows and theatre, we can offer you a great package deal with an overnight stay at Scandic Neptun if you book at Showpakker.no. Our hotel has 10 meeting rooms, with a maximum capacity of 120 people, and offers free WiFi to all our guests. Centrally located in Bergen, 2 minutes from Torgallmenningen square. Our hotel is located within walking distance of popular attractions such as Bryggen and the Hanseatic area, which is on the UNESCO list of World Cultural Heritage sites. Greet penguins, seals and fish in the Aquarium, or take the popular Floibanen funicular, which is located only a few minutes from our hotel. The Ole Bull Scene, Den Nationale Scene and Hordaland theatres are also within walking distance. The airport is 25 km away and the train station is just 500 metres from our hotel. The airport bus is a 2 minute walk away. Satisfy your appetite in one of our restaurants with carefully prepared dishes or visit our bar to relax for a while. In the morning, we put a little extra time at the breakfast buffet for you to get a good start to the day. 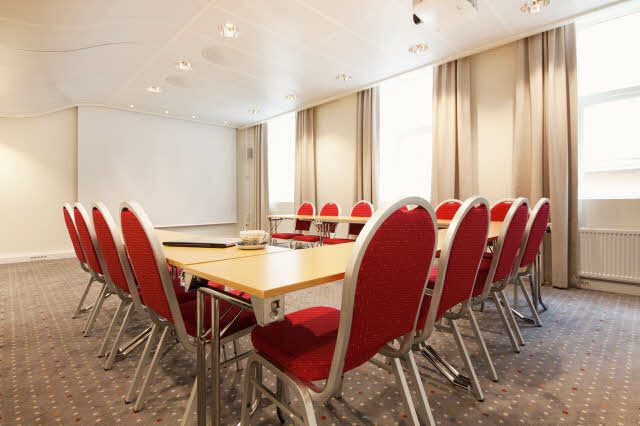 At Scandic Neptun, we can organise meetings and conferences of all sizes to suit all needs. Here you can gather 2 to 120 people under the same roof in the middle of Bergen city.